Discussion in 'Spree (Overseas Sites Only)' started by KittySpree, Dec 17, 2016. How to KittySpree with me! 2) Fill up merchandise details. 4) Wait for my confirmation email - Which will be send to you after I've close the spree within 3 working days if you have provide your email. 5) Wait for my shipping fee email - Which will be send to you when the package is ready to mail out. Roughly about 3 to 4 weeks after closing of spree. `- No payment, No orders, kindly transfer the funds after placing orders. `- No Confirmation needed. So I can close the spree ASAP, Use the latest formula for calculations. If you are unsure about the discounts, please leave instructions. `- No collection, Courier when package is more than 2KG or size bigger then A4 size, Only mail out via Normal or Registered mail. Default will be registered mail unless you indicate. `- No cancellation, changes or refund is allowed once order is placed with merchant. `- You can combine your package if you have orders from the same or my other sprees. Please allow 1 working day for me to email the combine bill to you. Once all the package is here, kindly provide me with the Spree and batch no. that you want to combine. `- I do spree by spree batch by batch, I do not switch the funds unless you indicate. `- In the event of Out Of Stock [OOS] item, I'll refunds or use excess funds for shipping fee, refund if any left. `- In the event when refund is needed, I'll refund within 2-3 working days after you provide your account no. and bank details. Preferred POSB & DBS Bank. `- Enquiries will be alias via email only. Kindly do not spam my email. Will reply within 2-3 working days. `- Working days are from Monday to Friday, Kindly understand that I need time for my full time job, family and myself. I'll try my best to reply emails asap. `- I will not be held liable for shipment delays from the merchant/freight forwarding company. `- I will not be held liable for any lost or damage of your items en route from US to Singapore. `- I will not be held liable for any lost or damaged after I've mail out the package from my place. `- I will try to avoid incurring GST. But should GST be incurred due to shipping, it will have to be shared among the spreeists. `- I reserve the right to cancel this spree due to poor response. `- You need to check the forum for confirmation of orders and shipping updates, I'll post the updates once I've the information. Items which are heavy/bulky must be prepared to pay more in shipping. 1st payment for Merchandise only. 2nd payment for the Domestic charges(if any)+International shipping+Local postage+Registered mail. For internet banking transfer - kindly use nick during transfer. For ATM transfers - kindly indicate your nick, date and amount of transfer via email. Please do not "Start a Conversation". Please do not "Start a Conversation" [Do not private message via SMH]. Transfer the funds once you place your order to prevent delays in closing, no confirmation needed. No Confirmation needed. So I can close the spree ASAP, Use the latest formula for calculations. If you are unsure about the discounts, please leave instructions. If any item is oos, just drop that item. Payment transferred via DBS IB under sleepymom. Txn ref MB740073911G89. Will u be using the getgifting discount code? Not Coach.com. There is no getgifting discount code. Oh cos I got the email from them. I will be interested to join if there's the additional disc. Thanks! Thanks for sharing. Will try to close one batch with that discount code provide. Hi, I check the coach outlet website. R the clearance having 40% off now? Up to when. When I click on your PDF file they will redirect me to the coach website but I can't view anything as I not member. Can fit iPhone plus ? is clearance items extra 40% ? Hi can confirm clearance now is at 30% off or 40% off. Hi is this spree confirm?? Currently, I do not have access to the website. Currently, next round is Dec 26. Hi shannie14, you able to access the sales now ? I still cannot enter into their website. Whay is the exchange-rates n factor? Hi kittyspree, please advise the rates. Thanks!! Include me in Coach Outlet spree. 2x ID Lanyard in Crossgrain Leather in Pink at USD19.50/pc. hihi. is my order being placed? I cannot find your item on the website. Do you have the style number ? 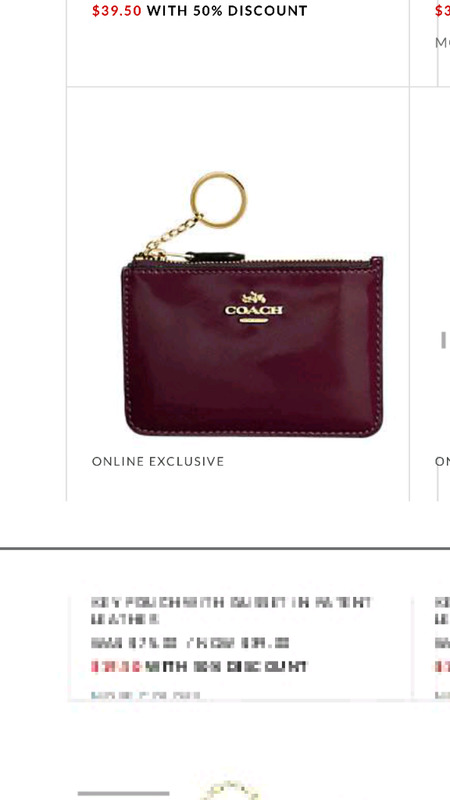 Next round of Coachoutlet sales will start on 11 Jan.
May I know How much is it to ship this to Singapore ? Total estimated how much with shipping in Singapore dollars ? Estimated SGD15-25 for the bag. Most of the coach item shipped are normally stuff with paper to keep the item shape intact during shipping. For 11 by 10 inches is consider as a big bag which may cost SG $15-35 range. Please take note that this is a rough estimation only. TAKING ORDERS.. CLOSING TONIGHT 11.30PM. Also emailed you the details below. Appreciate your confirmation of order, thanks.